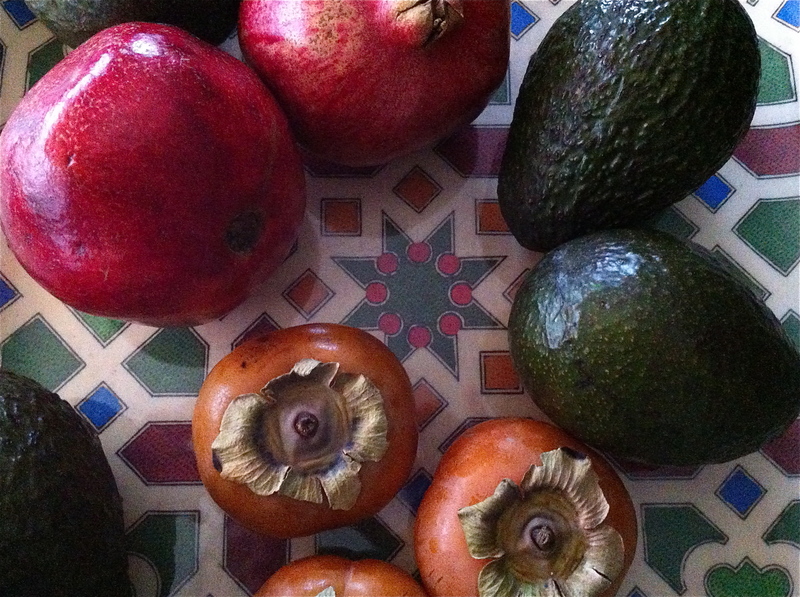 PUSHCART PARTY TRICK: GUACAMOLE WITH POMEGRANATE SEEDS AND PERSIMMON | Jane Lear. Writing on Food and Travel. The pushcart vendors in New York City are amazing. I’m not talking trendy food trucks here, but the unsung produce sellers who stake a claim near subway entrances and corner drugstores. This time of year, they jockey for position with the sellers of resiny Christmas pines, firs, and spruce. Where else can you pick up cocktail fodder and an apartment-sized tree (“It looks a little shrubby,” interjected Sam) all at the same time? A tree, a shrub, whatever. The point is that stopping to peruse the sidewalk greenery on my usual walk home gave me time to notice a juxtaposed jumble of offerings that included avocados, pomegranates, and persimmons. It triggered thoughts of a longtime favorite treat: Diana Kennedy’s guacamole Chamacuero, which you’ll find it in her book My Mexico—a cookbook, travel memoir, reference work, and, when published in 1998, an instant classic. Diana credits Leticia Sánchez, a resident of Comonfort (formerly called Chamacuero), a town near San Miguel de Allende, for sharing an old family recipe. What makes it noteworthy is that it contains peaches, grapes, and pomegranate seeds. Those fruits may not sound seasonally compatible to us, but in the local orchards around Comonfort, those fruits all ripen at the same time, in the late summer and fall. I first saw Diana make guacamole Chamacuero in the Gourmet test kitchens easily a decade ago, and the glint of juicy, ruby-red pomegranate seeds against pale-green chunks of avocado put all of the food editors in mind of Christmas. Peaches and grapes would no longer be seasonal, of course, but Diana exhorted us to improvise with pears. That proved to be a brilliant if inauthentic swap-out, and it’s what I did for ages. Until the other evening, that is, when the squat Fuyu persimmons I’d just bought spoke to me. Unlike the heart-shaped Hachiya cultivar, which is way too astringent unless completely ripe and soft, a Fuyu can be enjoyed when firm and crisp-skinned. Its flesh is almost apricot-like and faintly spicy in flavor; its acidity is subtle and complex. Cut into wedges, like a tomato, it’s wonderful in salads … and in guacamole. A rather long aside on pomegranates: The late essayist David Rakoff changed my life when he showed me how he extracted the seeds from the thick-walled fruit; he learned the method from a woman from the Republic of Georgia, where the fruit has been cultivated for millennia. 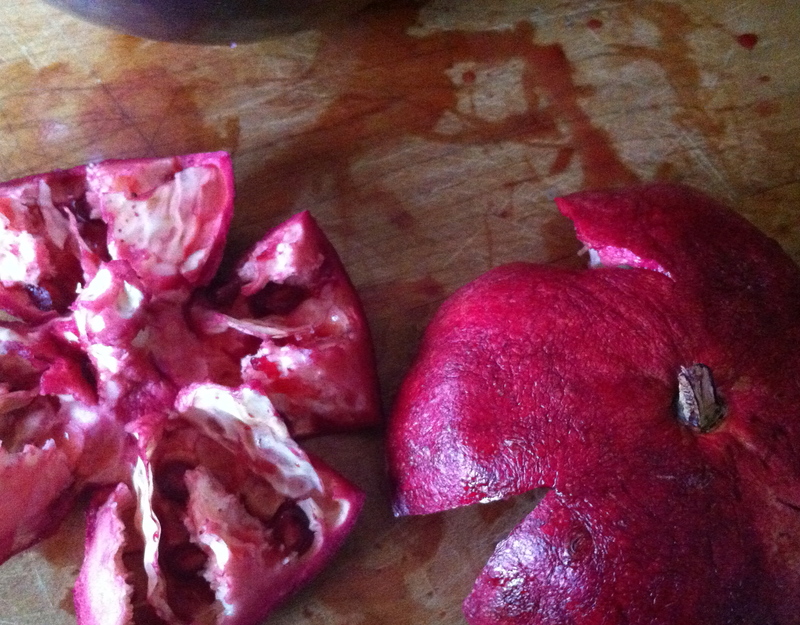 First off, cut the pomegranate in half crosswise—that is, through the equator. Then hold each half in the palm of your hand, cut side up, and (carefully) make deep cuts through the flesh and skin at 12, 3, 6, and 9 o’clock. Holding each half upside down over a bowl, give it a few whacks with a large metal spoon, and lo and behold, the seeds will rain down with a minimum of spatter and pith. My one embellishment on this method utilizes an oyster knife to flick out any stubborn seeds. By the way, whole pomegranates freeze beautifully in a heavy-duty zip-top plastic bag. Play your cards right, and a true guacamole Chamacuero could be yours. Cilantro is ubiquitous in many guacamoles, but not this one, so resist the urge. Lime juice is common as well, but hold off until you taste. The pomegranate seeds and persimmon generally add enough (and far more interesting) acidity for me. 1. Mash together the onion, chiles, and about 1 teaspoon salt to form a rough paste. Squeeze the pulp from the avocados and add it to the onion paste, roughly mashing to combine. Take care not to overmix; there should be plenty of luscious chunks of avocado. 2. Stir in the lime juice, half the pomegranate seeds, and the persimmons. Sprinkle the remaining pomegranate seeds over the top and serve immediately with tortilla chips. I thought I’d share my method for pomegranate seed extraction… I score the “crown” with a large knife and use it to crack the pomegranate open. Then I submerge both halves in a large bowl full of cool water and break it apart with my hands. The seeds sink to the bottom and the white pithy part floats. Just skim that off and drain the seeds. Super easy and zero spatter.